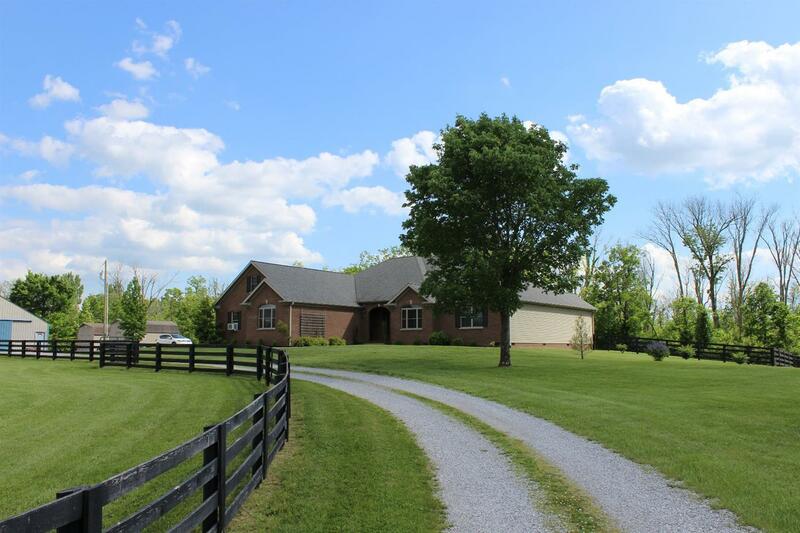 Beautiful custom built brick home on 6.4 ac. Mini horse farm. 36 x 36 3 stall barn, tack room, 2 open bays. 220 AMP. Water & Ele. Large paddock and riding arena. Fenced yard for dog. Nice plank fencing. 3 car attached garage. Large patio and covered back porch area. Home Features: Foyer, living room with vaulted ceiling/built-ins. Office with French doors. Formal dining room. Kitchen/stainless appliances. Large island/bar. Built in desk. Mini bar/wine cooler. Custom cabinetry throughout home. Tile backsplash, 9'ceilings, recessed lighting. Family room with stone fireplace/gas logs. Breakfast room. Laundry room. Large pantry. Storage. Large master bedroom suite. With double vanity and large walk-in double tile shower. Large walk-in-closet. Second bedroom suite with full bath/jetted tub. 3rd. bedroom/bonus room upstairs. Partial unfinished basement. Teak flooring, carpet and tile. Heat pump with propane back up. Two water heaters. Has tray ceilings. Gun Range for competition shooting.